Visiting the I am FarmHer Convention in Des Moines, Iowa was an opportunity to leave my farm and make connections with other female farmers. I would encourage female farmers, ranchers, ag business professionals, and anyone even considering farming to look to the 2018 convention for motivation, networking, and educational speakers. Not to mention making some lifelong friendships through a shared love of farming. When Mr. Steve Butler called to ask me if I’d be interested in being one of two female farmers to represent West Virginia at the inaugural convention, I jumped at the opportunity. Normally I wouldn’t leave the farm during harvest season, but I was flattered that he asked me and also excited to see a part of our country I had not seen yet. Then I asked if I’d be able to take my younger sister, Olivia Orr, as well. She had recently returned to help at the farm, and it seemed like a great trip for bonding and learning about our family trade together. Conventions are one of my favorite ways to learn current trends in agriculture, and I try to attend them every year during the off season. I did not study Agriculture in college, which I have regretted. I returned to our farm in 2006 to manage the retail market after leaving a 5-year career in Elementary Education. Since then I have gained a wealth of knowledge about ag business and agritourism, mostly through trial and error, conventions, classes, and studying what others do well. I still remember one of my customers asking me, “How do your parents feel about you leaving your profession to work at the farm market?” I politely explained that farming IS my profession and my parents were actually quite happy since they are farmers as well. Since that day I’ve tried to show that what I do for a living is indeed a profession by trying to better myself and my family business at every turn. As I watch my sister entering the arena of agriculture as a woman, I want to help inspire and educate her to reach her goals as well. The Only Orchardists out of 100 Attendees! We boarded the plane, not really sure what to expect. But we knew we had a few days off from work to get to know ourselves and each other better. Upon arrival in Des Moines, we immediately met some ladies who were waiting on the airport shuttle, and we giggled because we recognized that we were all farm girls headed to the convention. As we traveled to the hotel, I noticed that most of the other ladies in our group were in the beef, pork, poultry, and row crop industries. Later we would realize that we were the only orchardists in the group of about 100 women. There was one other lady from West Virginia, Britney Hervey Farris, who we would later meet at dinner. She has a farm called “Family Roots Farm” and we were able to chat a bit and discuss her maple syrup and her recent venture into the world of pick-your-own berries. The opening of the convention was a welcome that featured the T.V. series highlights from “FarmHer” that was shown on RFDTV. I had seen it a few times and found it interesting. However, Marji Gyler-Alaniz , the founder of FarmHer left us all speechless when she showed “So God Made A Farmer,” the popular Super Bowl Ad. She explained that as powerful as the imagery is in that ad, she was struck by the lack of women in that advertisement. That’s when I felt an overwhelming kinship with these women in the room that is hard to explain. I’ve been the minority so many times. Whether it be as a woman in ag, a farmer amongst many “professionals,” or a West Virginian judged by folks from other regions. Don’t get me wrong, I never give that much thought, but this was the first time I was part of a group of female farmers who were THE SAME as me! Even though we are part of agriculture in different realms of the industry, we all share a love of farming, and it was palpable in that room. Throughout the three days, I spent in Iowa there was a number of classes and speakers that left lasting impressions on me. My favorite was called “10 Habits of Highly Effective Women in Agriculture” by Jeanne Bernick. “Our Political Reality” by Amanda DeJong of the American Corn Growers Association highlighted how we should be more involved in Washington by sharing our voice. We can do this individually through letters and feedback to Congress, but we can collectively share our voice through trade organizations and groups like WV Farm Bureau. Holly Hoffman held a class called “Lead Simply” which went over leading and communicating effectively. There was also a tour of The Meredith Corporation, home of many publications including Better Homes and Gardens. Then we dined in Downtown Des Moines which I found very fascinating. My take away from this event has been large and lasting. I came home to West Virginia energized by the amount of great advice I received. However, I was astonished by the opportunities I saw highlighted for women just like me in the agriculture industry. Sometimes farmers become limited to our fence rows due to the large workload that comes along with our career choice. However, getting out in the world to see the opportunity that awaits us is so important. I know my sister felt energized as well to bring some new ideas to our family farm. I plan to attend this 2018 FarmHer convention to see the friends that I made this year and continue to educate myself….because farming is a profession! Get Ready for National Lasagna Day! What’s a great meal that can be made in a flash and feed quite a few? Lasagna! 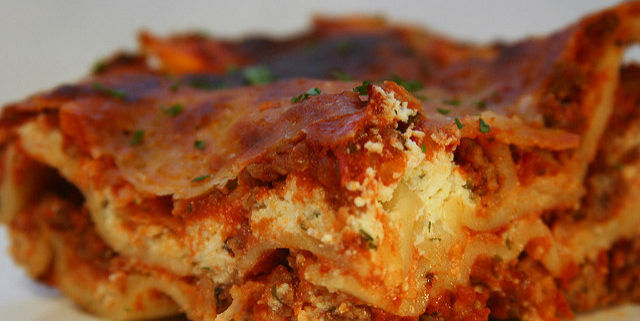 As an Italian food staple, we can’t wait to celebrate National Lasagna Day on July 29th! If you’re going to get in on the celebration, want to take your dish to another level? The next time you’re at the market, come by and pick up some homegrown tomatoes. We’re thrilled that they should be available on July 29 so that you can celebrate National Lasagna Day with your own special sauce. The best tomato varieties for sauce are Opalka and Roma tomatoes. If you want to make sure you’ll have what you need, give us a call to be placed on our canning list. Email orrsinfo@gmail.com or call 304-263-1168 and let us know which type you prefer! Heirloom Mix, Yellow, Red Round, Roma, or Opalka. You can also specify if you want #1 or canning tomatoes. Using whole milk or heavy cream will help thicken the sauce. All you’ll need is a splash of either option and then let it simmer for a few minutes to thicken. Add a little red or white wine. Adding a little wine gives the sauce a bit of acidity and amazing flavor. The best part is, you can sip on the rest at dinner! Add red paper flakes. If you like a little spice, some red pepper flakes will give your sauce an extra kick. Heat oil in a small Dutch oven over medium heat; add onion and garlic. Cook 10 minutes or until tender, stirring occasionally. Add tomato; bring to a boil. Reduce heat, and simmer 1 hour and 20 minutes or until slightly thickened. Remove from heat; stir in 2/3 cup basil, 3/4 teaspoon salt, and 1/8 teaspoon pepper. Set aside. Heat ricotta in a medium saucepan over medium heat until hot; stir in mozzarella, stirring until melted. Remove from heat; stir in remaining 1/4 teaspoon salt and 1/8 teaspoon pepper. Don’t forget to mark your calendars for July 29 so you can come by the farm to prep for National Lasagna Day. Send us comments and let us know how it turned out! https://orrsfarmmarket.com/wp-content/uploads/2017/07/5413268570_f85d9fd78d_z.jpg 426 640 Orr's Farm Market https://orrsfarmmarket.com/wp-content/uploads/2017/03/Orrs_WebHeader_2017-1.png Orr's Farm Market2017-07-20 08:33:252017-07-17 08:44:22Get Ready for National Lasagna Day! What says summertime sun more than sweet and juicy Orr’s Farm Market peaches? Whether it’s enjoying them straight out of the market, in a freshly baked pie, or summertime peach ice cream; Orr’s Farm Market peaches are a summertime staple. And we are lucky to have them this year! A couple of southern states like Georgia and the Carolina’s suffered close to a total loss of peaches this year. We’re feeling blessed at Orr’s to have a crop that looks so delectable on our trees. Our Semi-Freestone peaches are here, and we think they’ll stick around for the rest of the month, while our Freestone peaches will start around July 24 (so mark your calendars!). We expect Orr’s Farm Market peaches to remain in season through mid-September. Our peaches are sweet, juicy and will definitely tantalize your taste buds, but there’s also a bonus: making peaches a regular guest to your diet this summer bring advantages to your health. Did you know peaches are one of the largest fruit crops in the United States? That’s great news as they provide a lot of nutrients with few calories and no fat. In a large saucepan, heat half-and-half to 175 degrees; stir in sugar and salt until dissolved. Whisk a small amount of hot cream mixture into the eggs. Return all to the pan, whisking constantly. Cook and stir over low heat until the mixture reaches at least 160 degrees and coats the back of a metal spoon. Remove from the heat. Cool quickly by placing pan in a bowl of ice water; stir for 2 minutes. Stir in whipping cream and vanilla. Press plastic wrap onto surface of custard. Refrigerate for several hours or overnight. Place peaches in a blender, cover and process until pureed. Stir into the custard. Fill the cylinder of ice cream freezer two-thirds full; freeze according to manufacturer’s directions. Peach season is a fan favorite and one you and your family won’t want to miss. Visit us online, or give us a call at (304) 263-1168 to learn more about our other farm market products. We look forward to seeing you and your family enjoying Orr’s Farm Market peaches this summer. Take a picture and tag us on Facebook! Farming has been the foundation of our family for over 60 years, but not only is it important to us, it’s crucial to the members of our community. As people with a passion for our land and the community it serves, we want to provide the most ethically sourced products from our fields. In the world of farming today there are three big techniques: integrated pest management, no-till farming, and permaculture. At Orr’s we use “Integrated Pest Management” or IPM. In order to keep our produce healthy, we need to ensure that nature’s creatures don’t destroy any of our crops. This technique focuses on the most natural ways to maintain our farmland and its crops, spraying as minimally as possible. Using bug traps to monitor the insect levels before spraying. If the insect number are not high enough, then we don’t spray. We assist with federal government studies of invasive species. This allows us and other farms to stay ahead of the curve on harmful pests. We use “reduced risk” pesticides, many of which are labeled organic. We regularly collect soil samples that give us information to keep our crops growing in the cleanest purest soils. Year after year, we have centered our techniques on providing our customers with the freshest and healthiest crops. This is why we can guarantee that if it’s grown on our farm, then it’s non-GMO. Since we enjoy supporting other local small businesses, there are products on our shelf that haven’t come directly from our farm. In order to minimize any confusion, all of our products are clearly labeled with its state of origin. There’s controversy surrounding farming practices and the use of hybrid vs. genetically modified crops(GMO). Are they good or bad for you? Should I be feeding my kids these types of foods? We tend to find this topic often misunderstood. Hybrid crops are the result of crossbreeding between two parent crops. This does not change the genetic make-up of the crop, rather just a different variation of the intended crop. This is typically done when two parent crops have ideal genes or yields. Crossbreeding can allow you to capitalize on those yields producing strong crops in high numbers. The term GMO is a hot topic in the farming industry that’s been discussed in great detail. GMO stands for genetically modified organisms, and this practice has been used when experimenting with crops. The practice typically takes place in a laboratory with gene splicing. For example, BT Corn is corn that has been paired with a bacteria used in a pesticide. Bio-tech companies experiment with this variation of corn to include genetic make-up that will kill the pests that eat the crop. Why would this technique be relevant in the world of farming? GMO’s reduce pesticide use while increasing food production to feed an increasing world population on less farmland. Although this is an interesting method to consider, Orr’s Farm Market does not use this technique to date. We have put a lot of thought into the farming practices we’ve adopted. Our family lives and works on the farm, eats the produce daily, and even drinks the groundwater! The Orr family would only use farming practices that are safe for our children, our customers, and our land. Pay us a visit or give us a call today at (304) 263-1168 to get the latest information on our farm products. We look forward to seeing you at the farm!